Oracle continued to hammer home its message on the value of cloud at its CloudWorld event for customers and partners at the Waldorf Astoria in New York City. 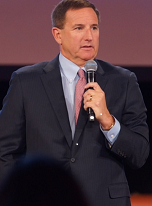 Cloud is critical to IT because of a confluence of trends, said Mark Hurd, Oracle CEO, in his keynote at the event, repeating a warning he has issued at past Oracle events. Revenue growth is stalled across the economy although earnings continue to grow through cost cutting. Worldwide IT spending has decelerated over the last 5 years, and there is an estimated 5.1% spending decline in 2015 alone, he noted. Observing that most CEOs last an average of 4 years on the job, he said they feel the pressure to drive earnings in a short time-frame. “What CEOs care about is business agility and entering new markets, financial growth, and survival," he said. The combination of these factors form the backdrop for IT investments. Along with the imperative to increase earnings, there is also a demographic shift taking place. Fifty percent of the workforce will be Millennials in 2020. Sixty-eight percent of Millennials demand an integrated seamless experience regardless of channel and 90% say access to real time product availability information would influence their shopping choices. And, they expect easy to use mobile apps that just work. Infrastructure is old, and old apps are running on that old infrastructure, resulting in 80% of IT budgets being spent on maintenance, leaving just 20% available for modernization and innovation. And, that 20% is increasingly squeezed by the burden of adding security to protect the aging infrastructure that houses precious company data. In short, the current on-premise IT operating model is unsustainable, said Hurd. Prediction 1: By 2025, 80% of production apps will be in the cloud: public cloud SaaS is 24% of the applications market today and 85% of all new applications today are architected for SaaS, Hurd said. Prediction 2: By 2015, Two suite providers Will have 80% of the SaaS Apps Market a full suite requires hundreds of applications including customer experience, HR, ERP, enterprise performance management, supply chain, and data with shared extensible schemas across suites significant reducing the cost and complexity of integration. Prediction 3: 100% of new dev/test will be in the cloud in 2025: Dev/test is one of the last managed and governed areas in IT, and dev/test suites offering rich standards-based frameworks and languages will dominate the market. Dev/test is 30-40% of IT spending, making it an attractive cloud workload for cost savings, and there is no reason for that not to be in the cloud, said Hurd. Prediction 4: By 2025, virtually all enterprise data will be stored in the cloud. More data is already stored in clouds than in traditional systems, tens of billions of IoT devices will generate massive amounts of new enterprise data using modern cloud based applications, and public cloud storage capacity will be sourced by service providers directly from component manufacturers, not existing storage vendor. Prediction 5: By 2025, enterprise cloud will be the most secure IT environment, said Hurd, who noted that currently 74% of organizations take three months or more to apply a patch, and in 2014, 99.9% of the breach exploits had patches available for more than one year that could have prevented them. Oracle applications in the cloud are more secure than anything customers could have on premise, said Hurd. A key differentiator for Oracle, said Hurd, is that it allows organizations to coexist on-premise and cloud and interoperate those two environments seamlessly and manage it through a single pane of glass. Oracle has introduced a new Big Data Preparation Cloud Service. Despite the increasing talk about the need for companies to become "data-driven," and the perception that people who work with business data spend most of their time on analytics, Oracle contends that in reality many organizations devote much more time and effort on importing, profiling, cleansing, repairing, standardizing, and enriching their data.